I gotta be honest… I found a lot more hope-shattering links this week than hope-filling. Since I’ve pledged to stay hopeful on CulturTwined through the end of 2012, I’ve been sharing those with anyone on the twittersphere who might have an interest (@katiworonka). Cheating, I suppose, to still dwell on what drains hope when I’m supposed to HOPING. But there you have it. But There Is Still Hope. There Is Always Hope. And here’s some hope I’ve come across in the past week. Landmark Paternity Case in Afghanistan Uses DNA To Seek Justice for Women. I love this one! A woman who was falsely accused who, until recently, would have had no recourse, has found HOPE in science! Choosing a new Coptic pope. 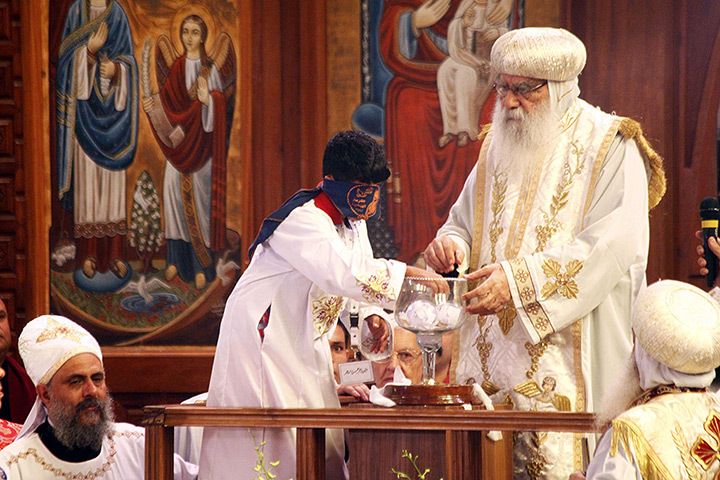 Did you know that the Coptic Church, one of the most ancient and established Christian traditions in the world, chooses its leaders by asking a blindfolded boy to pick a piece of paper at random? You can only institute, and follow, a system like that if you have HOPE. The new pope is Tawdros II. May you find hope all around you during this coming week! This entry was posted in hope, monday mining links and tagged Afghanistan, Copt, Egypt, Obama, women. Bookmark the permalink.